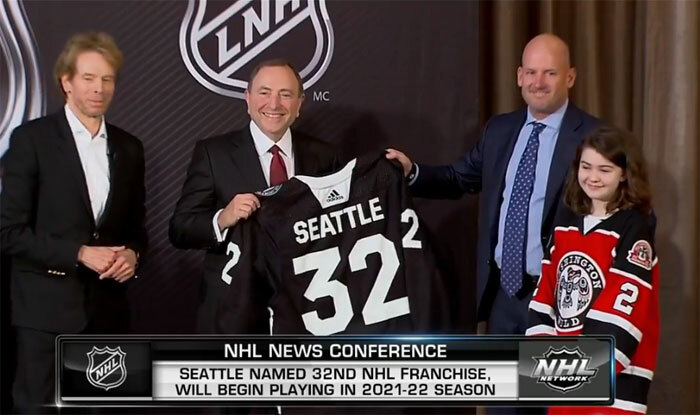 Image from NHL: NHL Commissioner Gary Bettman, center, accepts a Seattle hockey jersey from Seattle Hockey Partners Group co-owners Jerry Bruckheimer and David Wright. The National Hockey League’s Board of Governors voted unanimously on Tuesday, Dec. 4, to approve an expansion that will make Seattle home to the 32nd NHL franchise team beginning in the 2021-22 season. The Seattle team, which still lacks a name, will play in the NHL’s Pacific Division, the board also voting Tuesday to move the Arizona Coyotes into the Central Division. “A team in Seattle evens the number of teams in our two conferences, brings our geographic footprint into greater equilibrium and creates instant new rivalries out west, particularly between Seattle and Vancouver,” Bettman said. The Seattle hockey team will play inside the KeyArena, which is undergoing an $800 million upgrade by private developer Oak View Group. A groundbreaking for the expansion, from 400,000 square feet to 750,000 square feet, will take place on Wednesday, Dec. 5. “When you include the cost of reimagining and building Seattle Center arena, this is a transaction with a value of approximately ($1.4 billion), which shows an incredible commitment by everyone involved,” Bettman said. Tim Leiweke is CEO for Oak View Group, and his brother Tod Leiweke is CEO for the Seattle Hockey Partners ownership group and team president. He had previously been CEO for the Seattle Seahawks. Tod Leiweke credited his brother for having a vision for what the KeyArena could be and how it could elevate professional sports in Seattle. “If not for my brother Tim, we would not be here today,” he said during Tuesday’s news conference. Seattle Hockey Partners had been targeting a 2020 season start, but decided not to rush the work on the KeyArena to meet that original target. Bettman said it made good sense with the lack of certainty regarding the completion of the KeyArena. He partly credited the fans for the decision. The group took 32,000 ticket deposits in one day on March 1, fans crashing the Ticketmaster system in the first 12 minutes. KeyArena will have a seating capacity of 17,400. “We’re going to listen to our fans, and we’re going to do it right, and we’re not going to have a time pressure,” Leiweke said. Seattle Hockey Partners is also spending $75 million to construct a 180,000-square-foot training facility at the Northgate Mall. The NHL’s 32nd franchise team will be stocked under the same rules as the 31st, the Vegas Golden Knights, at an expansion draft in June 2021. Seattle used to have a professional hockey team, the Seattle Metropolitans, which Bettman noted was the first American team to win the Stanley Cup, when they beat the Montreal Canadiens at the Seattle Ice Arena in 1917. Bettman said the NHL has a division by that name, when the question of what the new Seattle team might be called. It doesn’t seem likely the Metropolitans will play again. “That was a long time ago,” Bettman said. As for an expected local rivalry with the Vancouver Canucks in the Pacific Division, Leiweke said he’s looking forward to it.